I used to (am) a big Nintendo fan.. I had it painted on my wall, every system, the works. Why do I mention that? 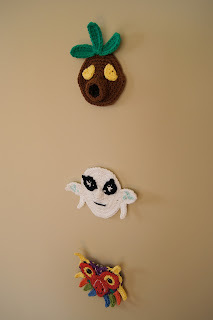 Well because the new Nintendo system, the Wii U, just came out this week and because of my love for Nintendo I felt the need to come out with a new pattern. One of my favorite game series, like many others, is The Legend of Zelda, and obviously, one of the best of them is the Majora's Mask. 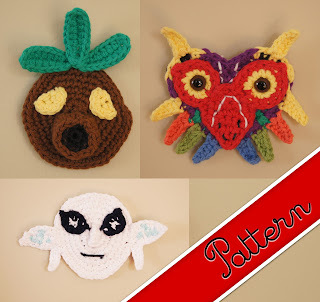 Check out my versions of the Deku, Zora, and Majora's Masks available now in the Ravelry, Etsy, and Craftsy Store!! 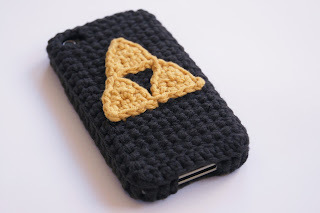 But that's not it, check out the free pattern below of how to make a simple, yet effective triforce! But what good is Link without a Triforce, right? 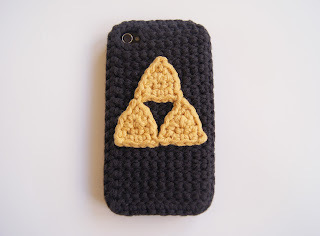 Here's how to make tiny but simple triangles, which when put together make a perfect triforce, as seen here on an iPhone cover (available in my Etsy store here). Rnd 1: Skip first ch, Sc one in next 3, turn (3). Rnd 2: Don't ch, skip first st, sc on in next 2, turn (2). Rnd 3: Don't ch, skip first st, sc on in next, turn (1). Rnd 4: Sc one in each Rnd and st around the little triangle, and at the corners, sc 1, m.p. (ch 2, sl.st in first ch), sc 1. Continue this pattern around the triangle then, after your 3rd m.p, sl.st 1 into the first sc made in this Rnd. Cut and pull through, leaving a long end to sew onto your project. 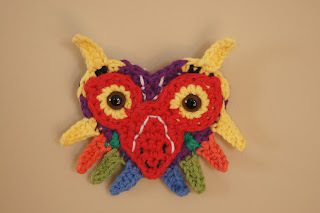 Make three of these and put them together to form a simple, and tiny, triforce. 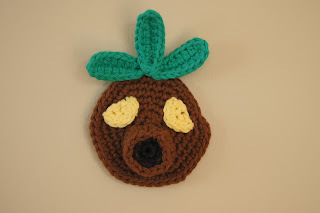 I know today's Thanksgiving, and I need to apologize for not coming out with a new pattern related to that, but here's a little gift. Tomorrow, as you may know, is Black Friday, and this Monday is Cyber Monday, you know... the days of the year where sales in store and online go out the ying yang. 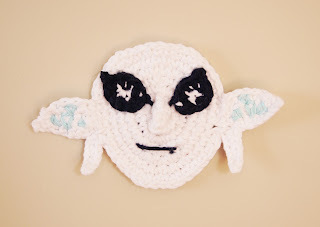 Check back tomorrow to get some coupons to go along side the awesome sales on my Etsy!